The Glasgow International Jazz Festival is one of the main attractions on the Glasgow music scene, and runs this year from late June to early July. The event, which features major stars such as Cleo Laine and Michael Legrand, is held in the Merchant City area of Glasgow and is regarded as one of the major jazz festivals in Europe. With an open air stage in George Square as the main attraction and concerts in the City Halls complex, Glasgow International Jazz Festival is an excellent reason for visiting this vibrant, highly cultural city. You will also find additional venues around the city offering performances by some of the hundreds of stars who are booked to play at the festival. For more information on this year's festival visit the official website at http://www.jazzfest.co.uk/. If you are looking or an affordable hotel near the Glasgow Jazz Festival venues the Sandyford Hotel is an ideal choice. Situated on Sauchiehall Street in the city centre, the Sandyford Hotel is within easy walking distance of George Square and City Halls complex, and is in a prime position for anyone wishing to explore Glasgow's many attractions. Rooms are comfortable and well appointed with en-suite bathroom facilities and WiFi access, and bed and breakfast is the way to go with a full Scottish breakfast included. With a promise of excellent quality at cheap prices the Sandyford Hotel is also well placed for local transport links, with the railway stations, underground stations and Glasgow International Airport all within reach. 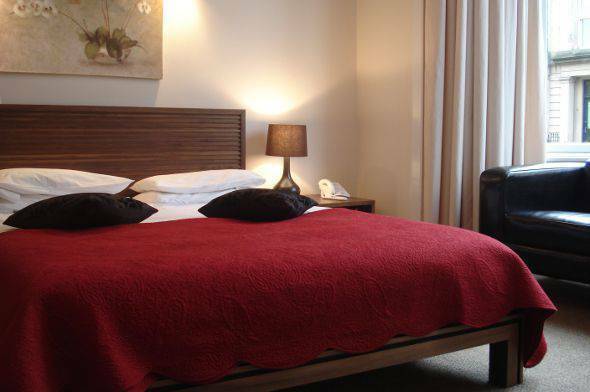 As one of the most popular B&B hotels in the city centre the Sandyford Hotel comes highly recommended, and as the ideal accommodation near to the Glasgow Jazz Festival's main sites is an excellent choice. You can also take a look round the popular West End of Glasgow and enjoy the many delights on offer. To check the availability of Glasgow Jazz Festival accommodation you can call the Sandyford Hotel on 0141 334 0000, or for reservations you can use the booking enquiry form at the top of the page or instantly book your room online.